Welcome back, duelists! Thanks for joining in on The Scoop, the absolute realest Yu-Gi-Oh! News Report on the internet, and of course it's right here on ARG! This past weekend was one for the books! YCS Dallas is history now and Erik Christensen has emerged victorious with a commanding 16-0 record! The deck he piloted the complete way to victory was none other than.... Infernoids? "Wait, what?! Infernoids went 16-0 and WON YCS Dallas? That's impossible right?" "No way, he had to be a savage stacker!" "He opened double Reasoning every single game! Cheater!" That's right. those are quotes directly from the ever-so-skeptical Yu-Gi-Oh! community. It's sad how people who weren't there or never played the guy have drawn such stark conclusions based only on his deck in relation to his record. This isn't the first time an unexpected deck was piloted to victory in the slightest. We watched a slow T.G. 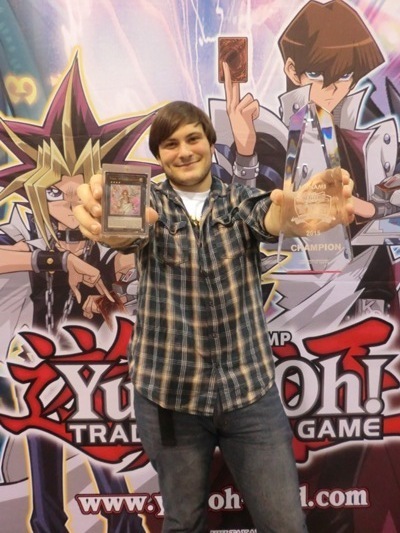 Stun deck without Solemn Warning or Maxx "C" take the victory in a format full of Wind-Ups at YCS Atlanta a few years ago; and although there was still some outrage, there were hardly accusations of cheating. So I wanted to get to the root and get the story straight from the source. That's right, I got with Erik, himself, to inquire about his journey to becoming a YCS Champion and see where he stood after all of this. Without further ado, here is my sit down with Erik Christensen. Hey Erik! Glad to have you here with me! First off congrats on your win and also going 16-0. Fantastic job! So you played Infernoid; how did you come to the conclusion to play the deck? I just think the deck is really strong against everything that isn't Qli, and I've practiced against very good players who know how to play all of the top tier decks extremely well. Reasonable enough, going with what you were confident in! What choices did you face when making that decision? Not really any choices, just was like "ok time to play with a [expletive] deck." Well I guess that's one way to go about it! So you went undefeated throughout the tournament, obviously. After going 11-0 during swiss, did you believe you could overcome the "Curse" like some great duelists, and TJ Kinsley have and win the whole thing? I walked back to my hotel with my friends after Day 1, and my friend Karlos and I were talking about the rest of the tournament and I was telling him how all I was seeing was Minerva and how I wanted it for my deck. All I could think about was winning it. That's some determination right there! When you won, how did you feel? I knew I won during the match. It wasn't a nail biter, or anything that was intense. He opened poorly, and I had an insane reasoning mill. It was as simple as that pretty much. All I really remember about that exact moment was the sound my friends made when I attacked for game. Insane that the finals match wasn't even intense! How often does that even happen? So since that match wasn't too tough, what was your toughest match of the day? I played an insane BA player round 7. He knew how the deck worked, inside and out just like I did mine. I don't remember the exact scenarios of the entire match, but I do remember the ending of it, along with we both opened well the entire match and both had our sack you moments. In game 3, time was just called, and I was turn player. I ended my board with a Felgrand with two attachments, and a Royal Decree, blocking a face up Vanity's Emptiness and two backrow. I believe he normaled Graff and crashed along with some combo of Foolish Burial, and made an Acid Golem. My second turn in time, I drew Patrulea, put Felgrand in defense and passed. He ran over my guy and passed again. I remember the life being 3400 to 1200, and thinking that even if his Acid had to burn himself, it still wouldn't be enough for game. I drew Raiden, summoned him and Patruela, made Castel, summoned Attondel, and beat him in the last turn in time. He was the hardest opponent I played and was really good at the game. Plus very respectful and good spirited and wished me luck further on. Fantastic ending to what I'm sure was a good match! Did you play any players that you've always wanted to play on your way to winning? Nah, I don't really fiend to play against any player. I played against people I had heard of like Tyree Tinsley, and Matt Kolenda, and obviously those were nerve racking matches knowing I'm going up against pros. But I lost my jitters around round 5 and from there on out I was focused. I see, well you were clearly focused. Alright, so you're obviously aware of the things people are saying around the community in regards to you winning with Infernoids, so let's talk about that for a bit. What do you think of the controversy surrounding your victory? People are going to say anything, but honestly I don't care too much. For the record, (even if people don't believe me) I did not stack, cheat, or anything of the sort. I think the rumor started because in Top 4, the judges took my deck for a few minutes and came back to me and told me that a few cards were, by their definition, marked. They said this didn't necessarily mean they were marked with a marking, but warped and (supposedly) easy to distinguish and cut to. The three cards were Torrential, One for One, and Galaxy Cyclone. My Torrential was the LOD one, so I can understand it being warped after 10 years. Sorry I like nice looking cards. The One for One was slightly beat up cause I pulled it from a box of stuff in my room. My bad. The Galaxy Cyclone, as told to me by the judge who judged my top 4, to his knowledge wasn't warped in any way, and thought that even the other two were very difficult to see with the warping. He apologized to me after it happened and said that it shouldn't have occurred in the first place. He was a very nice guy and I wish I knew his name to give him credit as a judge. Also, I dont even know how to stack. I like Pringles stacks, but that's about as far as it goes. I consider myself one of the more upstanding people I know. And I don't ever want compliments for that or anything, it's just how you're supposed to act. People can act and play scummy, but I try to shake hands with everyone and wish them luck in the tournament going forward regardless of how the results of a match end up. That's just how I play. Fair enough. I understand your point of view and hope that you're being nothing but sincere in your words. I don't have any evidence of you cheating or stacking so I, for one, would never be in a position to make that assumption. The card that they say you opened with often is Reasoning. It propels your hand into something potentially amazing. Did you actually open reasoning a fair amount of the time or is that just speculation? Once I reached top 32 and onwards, those sleeves they gave me drew BATINGA BONKERS. I drew reasoning a ton. Not even lying. In the main event however, I didn't open it that much. Obviously I opened it, but not as often as everyone seems to think. I made my deck to not rely on Reasoning since I know it's impossible to open it every game. I play seven normal summons, 3 Reasoning, Monster Gate, two Charge of the Light Brigade, and One for One. That's 14 cards, and I want to open just one of them. Not 3 out of 40. I never claimed my deck was the best, or that I didn't have luck in my matches. Obviously I was lucky in some scenarios, like the BA guy round 7, drawing back to back fours, but I also know how my deck works and how every deck in the Meta works. I know when to use my cards and when not to. I'm not a cheater, or a luck sacker. I earned my win just like any other YCS winner that came before me. Also, Minerva wasn't stolen, gave it to my friend to try and sell. Thanks for that! Anyone you'd like to thank or shout out? Jesse Gonzalez is a pretty dank meme who was by my side through it all along with Casey Hutchinson. But obviously a ton of my friends all helped out but there are too many to list! Perfect! I appreciate you taking the time to sit down and discuss your controversial YCS Dallas victory with me! I hope that you continue to do well and that we see you in Top Cut more often! Annndddd that's it for The Scoop for the week ladies and gents! I thank you all once again for checking out my sit-down with Erik Christensen! As always, if you have news you'd like to see investigated or people you'd like to see interviewed, drop it in the comments and I'll make my absolute best efforts to bring it all right here to you! Until next time, as long as there is a next time, Play Hard or Go Home!! Deck is better then people give it credit. It has been topping a lot of events lately and its my main deck of choice since it came out and been playing it since DN debuted it. Heck I even recently got my invite with it at the Indy Regionals of 400 people and should have had the chance to play for top 8 but I got a RD1 lose due to signing up late and only losing two games outside of that….Kozmo/mirror match. Mirror was for top 16 slot. As far as the guy who mention Nekroz well I beat 3 Nekroz players in that event and 2 out of 3 of those games I deliver that swiftness and I continue to do so with damn near ever Nekroz player I go against.